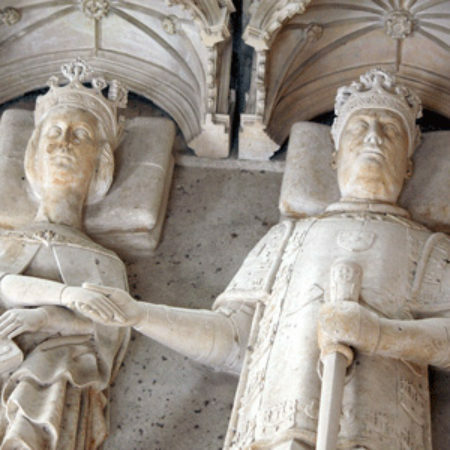 João I of Portugal (d. 1433) and his queen, Philippa of Lancaster (d. 1415) were founders of the Avisian royal line, the second to rule in Portugal. In the first decades of the fifteenth century, for the first time in the history of the Portuguese royal family a funerary chapel was conceived and purposely built as a royal pantheon. Significantly, João I (r. 1385-1433) had ascended to the throne not through direct descent but by appointment by parliament (the cortes), and force of arms – namely following his victory at the battle of Aljubarrota against Juan I, king of Castile, whose wife, Beatriz, was the sole legitimate heir to the Portuguese throne. The innovative dispositions made by João I concerning his burial place provide evidence for a sense of statesmanship that derives from this, and was thus first played out in his reign. Other contemporary factors seem also to have helped promote the tomb’s unprecedented grandeur. These were indeed new times, when a political and institutional message was purposely and carefully formulated, as befitted the founders of a dynasty whose aims included sustaining and emphasising its links with the past. This new dynasty was also one imbued with new principles and values. In fact, royal funerals tended to become, from João’s reign, richer and more complex affairs, thus showing the increasing awareness of the importance of such ceremonies, as well as their potential to demonstrate the magnificence and exceptional character of monarchical power and, indeed, of the monarch himself. Accordingly, the description made by chroniclers of João I’s death is the epitome of the ‘good death’ on one’s deathbed, infused with ritual and symbolism. As such, it functions as a reference point for the royal family and the court. The act of dying, in the way it is described, therefore resonates with the new outlines of royal commemoration, in the shape of João’s most personal architectural project: a funerary chapel within the monastery he had erected to honour St Mary the Virgin, summoned for protection on the eve of the battle of Aljubarrota. This cannot be separated from the rising notion that the dynasty he heralded was divinely consecrated. The options taken in the conception and design of João I and Philippa’s memorial are its other major novelty. 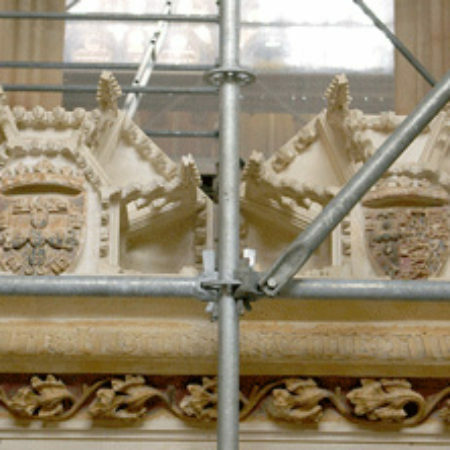 The tomb is composed of a large, box-shaped, limestone chest, supported by eight lion statues and covered by a lid on which the effigies of the royal couple rest. Two extensive epitaphs, commissioned by their son, Duarte (r. 1433-8), garnish two of the sides of the tomb chest. 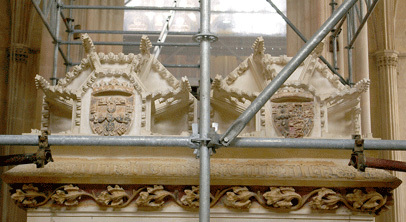 No decorative elements appear on the chest apart from these inscriptions, except for foliage and heraldry (of the kingdom of Portugal, of the Order of the Garter and, at intervals, the badges of João and Philippa). Moreover, this is – strictly speaking – the first joint tomb chest ever to have appeared in Portugal. Such innovation, further to the tomb’s commemorative and laudatory aspects, also helps explain its exceptionally grand dimensions – 148″ long x 67″ wide x 42″ tall (375 x 170 x 184 cm). The processes of development this tomb exemplifies cannot be seen separately from earlier joint tombs in Portugal. In spite of each being devised as one single undertaking, these tombs were in fact sculpted and displayed individually. 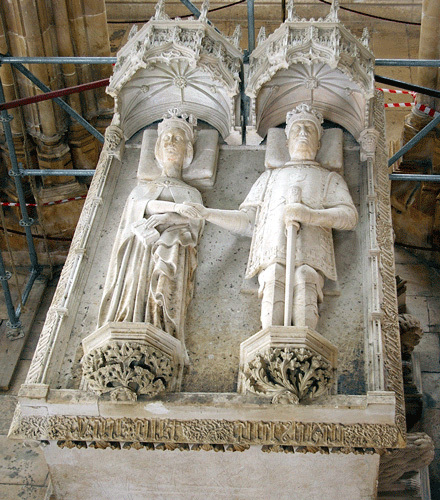 The model used for João I and Philippa – a single compartment covered with a lid featuring the two effigies – is, however, an absolute novelty, and most likely the result of influences from abroad; namely from England, as some scholars have suggested, considering the well-known cultural role that Phillipa played. Besides, the need to find a more unusual model for the burial place of the founders of Portugal’s new royal dynasty may also have lain on the need to assert the independence of the kingdom and the dynasty, in particular from Castile. What might appear as the lessening of the king’s and queen’s individuality is offset by the construction of a message which surpassed the sense of the individual’s confrontation with death, and might achieve great political impact. Hence, this is not so much a discourse where the believer has stepped forward, supported by his intercessors, to face the Last Judgement, exercising one’s own virtues and social position, as seems to have been the case with earlier, fourteenth-century, tomb art. Rather, death itself is here taken hold of as an occasion for propaganda; as the ultimate expression of the royal couple’s role as founders of a new age and the guarantors of an illustrious progeny. João and Philippa are shown hand in hand – yet again, it would appear, denoting English inspiration. 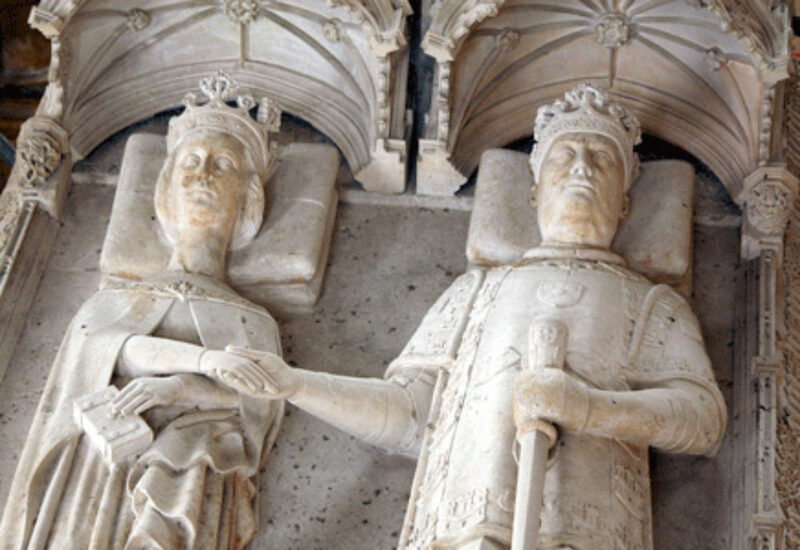 King and queen trace for themselves an image of perfect marital union, exemplifying a model of virtue that (as in many other respects) seems to have been set as an example for others to follow. Notwithstanding the queen’s representation as a virtuous and pious woman (her left hand holding a prayer book), she is somewhat overshadowed by the way the king presents himself, due to the meaningful and innovative character of his effigy. Unlike earlier Portuguese tombs, whose model was non-military, João I is depicted as a soldier-king, fully clad in armour. He had ensured independence from Castile and the continuance of the Portuguese kingdom, and had conquered Ceuta, which stood as a symbol of an expansionist policy and of the struggle against Islam, now carried out beyond the borders of the Iberian Peninsula. Certainly, he is the image of a miles christianus, the bold warrior and defender of Faith, who emerges both as a reference to victories won over the Muslims in north Africa in the onset of the Portuguese expansion, and also thinks back to a mindset which, belatedly, sought to recover chivalric and crusading ideals. The non-existence of overt religious references in the tomb’s decoration (although we must not forget the altar which originally stood by the tomb) should not therefore be mistaken for an absence of religious meaning in the ensemble. Rather, such meaning is balanced with the underlying message in the construction of the king’s image as a model of militant Christianity. Further to this, some influence of a chivalric kind might also be perceived in the tomb’s iconography. Thus, be it through heraldry, the military character of his effigy, or the inscription recalling his most prominent deeds, João I is memorialised, in his tomb, through his achievements. As follows, the apparatus surrounding the conception of João I’s burial place is a clear reflection of his rule while king, guided by two fundamental aspects: the assertion of royal authority and the establishment of an atmosphere of prestige surrounding the new dynasty, associating it with a divinely conferred image of authenticity – unpolluted, charismatic and nationalistic. On the one hand, foreign influences were adhered to and adapted. On the other, there is a sense of continuity from the local tomb art of the past, noticeable in Philippa’s effigy. That the tomb was (to our belief) the work of a Portuguese artist probably favoured this conservatism, framed by traditional practices and the customs of the land, but which all the same took absolutely innovative models as inspiration. 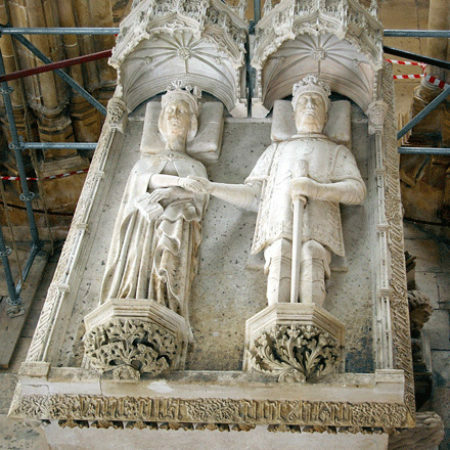 The monument to the founder king and queen of Portugal’s second dynasty is in many ways a turning point of great significance and innovation. 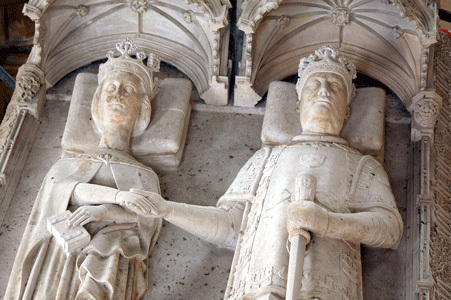 Entirely original in its form, the tomb of João I and his Lancastrian wife would truly become a model for Portuguese tomb art in the fifteenth century, inspiring both monuments for other couples and for other knights individually, which from this point onwards always appear with a distinct military character.